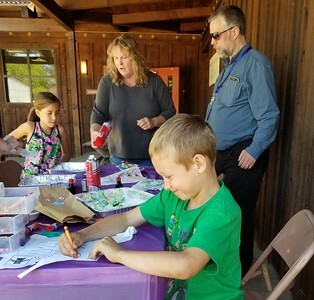 Aura Whittaker for The Willits News Ella and Jerett learn how to make marbled paper with Mendocino County Library Director Karen Horner and Willits Library children’s librarian Benjamin McBean. 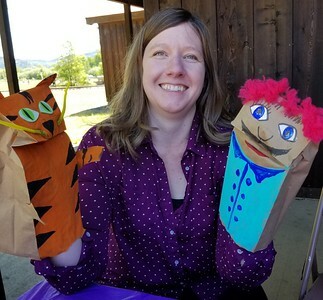 Aura Whittaker for the Willits News Museum curator Karen Mattsen shows off the paper bag puppets she said she was inspired to make based off some of the art pieces in the new exhibit. 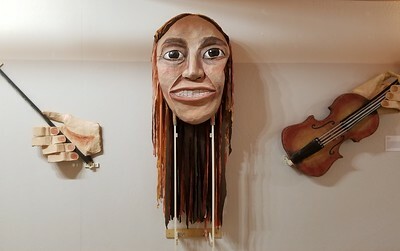 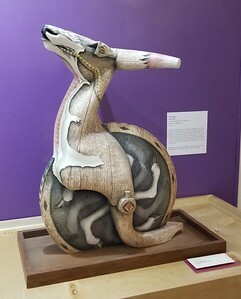 Aura Whittaker for the Willits News The Mendocino County Museum owns an extensive collection of items associated with the famous environmental activist Judi Bari and the Earth First movement including this paper mache puppet on display in the long gallery. Aura Whittaker for the Willits News These folk figures, Papa and Mama, made by Mark Walker were commission by the museum for a folk exhibit in 1986. 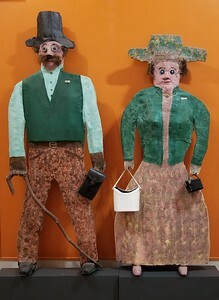 These folk figures, Papa and Mama, made by Mark Walker were commission by the museum for a folk exhibit in 1986.